When Manly Art Gallery & Museum asked me to respond to the work of Ethel Carrick Fox for the Great Wall of Manly I had only ever seen one or two of her paintings and no real idea of who she was. I now understand her significance as a trailblazing female artist whose adventurous spirit saw her challenge the status quo for women of her era. Carrick travelled the world with her husband and artistic partner E. Phillips Fox, painting ‘en plein air’ compositions that observed life wherever they were. Ethel Carrick Fox’s paintings of women and children enjoying the beach in and around Manly resonated deeply with me as they conjure memories of school holidays spent at the beach and amongst the natural playground of the Northern Beaches. Stripes, umbrellas, hats, figures, simplified shapes, shadows and light are strong elements in Carrick Fox’s paintings. I wanted to present these same elements in a contemporary way for the Great Wall of Manly public artwork that is intertemporal and captures the essence of people, time and place. Installation documentation and video coming soon. The Australian bush conjures up a deeply felt anxiety in many whom may have, at some point, wandered too far from the track. Beguiled by its beauty and the excitement of exploring the untamed, imagination takes hold and adventure can soon lead to misadventure. Stories of lost children – in early colonial paintings and narratives such as Picnic at Hanging Rock – have become folklore, holding their place in the Australian psyche. The Ku-ring-gai Chase National Park is the chosen setting for this exhibition which seeks to re-imagine the notion of being lost in the Australian landscape via painting, installation and photography. White Australia has an unease with our identity as displacers of Aboriginal heritage and it is this anxiety which has been explored time and again through film, literature and art. Sadly, the Garigal ancestors of this landscape are lost to us; their rock carvings are set to fade away as there are no known descendants with the wisdom to perform the re-carving ceremony. In response to the landscape around Eramboo, my work focuses on the figurative aspect of the landscape via painting and a new aspect of my practice – photographing my paintings within the Ku-ring-gai Chase National Park. Placing a painted portrait or figurative work in the landscape heightens the paintings meaning, which in turn accentuates the psychology of the landscape and a sense of the uncanny. The intention of the installation is to create an immersive experience for the viewer. By exhibiting paintings away from the traditional gallery space and effectively sending the audience on a bush walk, they will experience the works in the poetic Australian light. Furthermore, the displaced works and audience is a reminder of the bush and its eerie magnetism. The oil paintings on aluminium installed on trees are influenced by “lost children narratives” and also conjure up missing persons’ posters. Conceptually, my work is closely aligned with the Australian Gothic mode and references psychological connection to landscape – specifically white Australian anxiety associated with being alone or lost within a foreign landscape. My work interprets imagery of people ‘lost’, whether in a physical or emotional sense. Referencing a bygone era, paintings on aluminium have been directly influenced by daguerreotypes, working the painting as though on a photographic plate – scratching and sanding back the layers to reveal aluminium and a damaged aesthetic and conjuring up ghostly images of figures, histories and identities erased. Two painters consider the relevance of landscape in the contemporary Australian psyche. From the shabby grandeur of Guthleben’s still life-landscapes to Dzubiel’s immersion of the human figure in the bush, their work explores themes of isolation, fear and nostalgia, and hints at degradation and dark histories. With references to art history and Australian cinema, their work plays on gothic sensibilities, tiptoeing between the familiar and the terrifying; innocence and loss, and the idea of the Other. While they differ in painting techniques and palettes, each relies on figurative elements to question our disconnection from the landscape and its consequences. The Australian Gothic has been described as an overlooked genre in conventional readings of Australian art history. However, recent exhibitions such as Weird Melancholy: The Australian Gothic (2015) have focused on this stylistic approach, showing how artists from the eighteenth century until the present “registered the anxieties, disorientation and sometimes fear inherent in colonial and post-colonial responses to the natural landscape”. The gothic sensibility has persisted in Australian visual art for centuries, “from Eugene von Guerard’s meticulously botanical forests, to Hugh Ramsay’s moody portraits; from the oppressive verticality of Fred Williams’ gum trees to Louise Hearman’s spectral presences and otherworldly landscapes”. Ideas of home and country are at the heart of The Australian Gothic, which often deploys the tension of familiarity and alienation in the treatment of the landscape, interiors and figures. In this context, Peta Dzubiel and Jane Guthleben explore an intuitive, painterly response to these themes expressed through the weight and body of paint. They exploit the palpably tactile dimension of painting in a way that invites the use of the eyes as organs of touch. This way of seeing imparts a visceral connection with the world of images in which the sensual qualities of the medium evoke the hedonic and mnemonic aspects of tactile experience. Both artists stress the physical aspects of painting; the way that it encompasses “bodied words, tactile signifiers and gestic acts”. The work in Remote taps into the “problem of being a stranger in one’s own land” that has arisen in the wake of Australia’s colonisation by white settlers (not to mention this country’s continuing political disputes over the protection of borders and who gets to “belong” here). As Lisa Thatcher suggests, white Australia encompasses the psychic history of entering into occupied land and claiming it, which generates “a feeling of unease in our relationship with the physical earth in this country, and a troubled identity as inheritors of European culture and displacers of Aboriginal heritage”. The sense of disquiet underpinning this anxiety, combined with what Marcus Clarke famously termed the ‘weird melancholy’ of the Australian bush provides fertile conceptual territory for Dzubiel and Guthleben. Peta Dzubiel uses ‘found’ daguerreotypes, as well as stills from the classic Australian film Picnic at Hanging Rock as source images for paintings. She cites the ‘eerie magnetism’ of the bush as a quality peculiar to the Australian Gothic sensibility. This strange attraction is underscored by the duality of seduction and veiled threat that characterises the atmosphere of her work. The figures in Dzubiel’s paintings exist in narrative and painterly exile—half there, half gone—on deteriorated surfaces of aluminium and copper, or subtly integrated into the landscape in photographs of her paintings installed in bushland. These photographs employ the subterfuge of a picture inside a picture, invoking a spatio-temporal disjunction that one might associate with the feeling of being lost, or ‘out of time’. Jane Guthleben’s paintings assemble archetypal Australian objects, clothing, and tableware in abundant displays of “the ugly and the ordinary” that construct “the remarkable on the unremarkable”. These things are often juxtaposed against lonely skies or sparsely vegetated horizons that suggest the arid centre, remote dwellings and the austerity of early colonisation. Jane draws on personal histories—she says, ‘our farm dining table is an object that really fires my imagination. It was brought from Ireland in 1876 by the Irish siblings we descend from. I can sit there today and imagine how scary it was to travel through the 1870s bush to their settlement, and have to make a meal and a respectable home’. It is the quality of the domestic that holds sway in these paintings, drawing attention to the way the concept of home looms large in the emotional profile of formative experiences. These experiences and memories underpin the structures of familial and national identity that span both the homely, and the unhomely (unheimlich). Painting has an immediacy that can spark an unexpected response to images. It can bring together such complex significations as isolation, heat and aural effects in the depiction of land, objects and people through the richness of texture, the rawness of an edge, a hectic colour contrast or the ghostly echoes of erased imagery. The Australian Gothic is well orchestrated in the hands of such skilled painters, who are able to manipulate materiality to keen emotive and psychological effect. As playwright Stephen Carleton has said, “our history haunts us and the land we live upon”. In this exhibition, we can both see and feel this sentiment on display in paintings that ultimately bridge the implied distance and histories that the title Remote suggests. From the exhibition overview in MUSSE (Melbourne university staff and student news), http://musse.unimelb.edu.au/july-15-163/weird-melancholy-australian-gothic. Accessed 30/6/2017. Weird Melancholy: The Australian Gothic was curated by Suzette Wearne for The Ian Potter Museum of Art, The University of Melbourne, (Apr 2-Aug 9, 2015). From the exhibition overview in MUSSE (Melbourne university staff and student news), http://musse.unimelb.edu.au/july-15-163/weird-melancholy-australian-gothic, Accessed 30/6/2017. The Ian Potter Museum of Art, The University of Melbourne (web), http://www.art-museum.unimelb.edu.au/exhibitions/exhib-date/2015-04-02/exhib/weird-melancholy-the-australian-gothic. Accessed 30/6/2017. L. U. Marks, Touch: Sensuous Theory and Multisensory Media, Minneapolis, University of Minnesota Press, 2002, introduction, p. xiii. I borrow this description of theatre from Rebecca Schneider in “Judith Butler” in my hands, in: Bodily Citations: Religion and Judith Butler, E. Armour & S. St.Ville (eds. ), Columbia University Press, 2006, p. 247. See: L. Thatcher, The Monster Within: Australian Gothic emphasises the terror of the familiar, The Essential (web), 2015 http://theessential.com.au/features/essential-down-under/the-monster-within-australian-gothic-emphasises-the-terror-of-the-familiar. Accessed 30/6/2017. This statement concerns the work of Australian filmmaker Peter Weir in, L. Thatcher, ibid. (Thatcher cites D. Thomas & G. Gillard, Ten Types of Australian Film Chapter 9: Gothic (2009) and S. Dermody and E. Jacka The Screening of Australia Volume 2: Anatomy of a National Cinema (Currency Press, 2000) as touch stones for this article). Marcus Clarke (24 April 1846 – 2 August 1881) was an English-born Australian novelist and poet, best known for his novel For the Term of His Natural Life. Email correspondence with the artist, 30/6/2017. In his essay titled “The World and the Home” Homi Bhabha draws on Sigmund Freud’s concept of the “Uncanny” (“unheimlich”). In its original sense, Freud’s uncanny or “unhomely” refers to the estranged sense of encountering something familiar yet threatening which lies within the bounds of the intimate. See: The Cultural Reader: Article Summaries and Reviews in Cultural Studies. http://culturalstudiesnow.blogspot.com.au/2014/03/the-uncannyunhomely-in-bhabhas-home-and.html. Accessed 30/6/2017. S. Carleton, “Introduction Surviving Jonah Salt”, in K. Ash, et al., Plays from the edge: two plays from northern Australia, Playlab Press, 2004, p. 107. Two plays from northern Australia, Playlab Press, 2004, p.107. Eramboo Artist Environment is proud to present LOST. This exhibition seeks to re-imagine the notion of being lost in the Australian landscape via painting, installation and photography. Come with the family to explore art outside on the beautiful Eramboo property. When did you start painting & which teacher/s influenced your practice? I started my BFA at the College of Fine Arts when I was 19 in 2003. 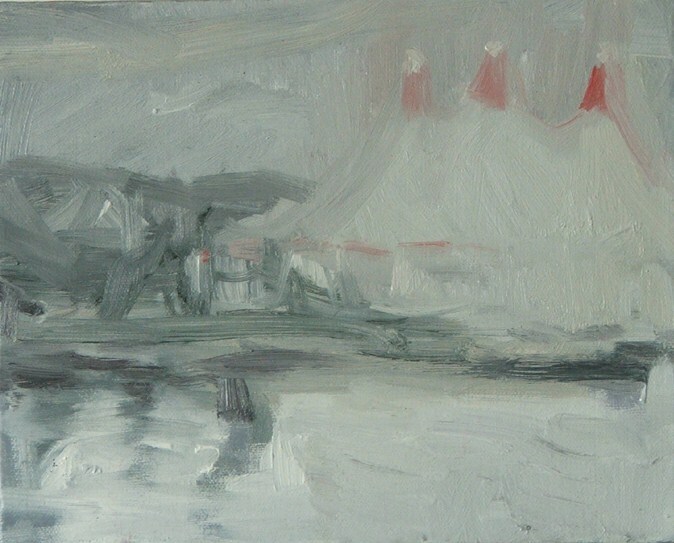 I always loved and felt drawn to landscape painting, so I was very happy to have Ian Grant as a painting lecturer. I was also very lucky to have the late Alan Oldfield during my first year and he had a great rapport with students. He introduced us to the technical aspects of painting, mediums, colour mixing and different supports on which we could work on. I used to paint a lot on primed cardboard as it was economical and gave a nice effect. I also had Andrew Christofides, Idris Murphy, Peter Sharpe and Nicole Ellis and they made us examine our work conceptually. Sally Clarke and David Eastwood ran dynamic workshops which I really enjoyed. During my Honours year I had Chelsea Lehmann as a supervisor and her influence, support and friendship has remained strong. Chelsea has been a mentor to me and much of my knowledge of painting and confidence as an artist stems from her teaching. What do you want to achieve with paint that you haven’t already been able to achieve? I want to paint larger figurative work and keep exploring new colour palettes. I want to be more expressive but detailed too. It’s a conundrum! What can paint do that other art-forms are unable to? I think there are many reasons painting is still on the radar as a valid art form. Painting can render an emotional response unlike any other medium whether it be by representational or non-representational means. Colour, texture and tone are several key elements that come into this. Painting can also deal with brutal subject matter with relative sensitivity. For example, Picasso’s Guernica is an epic painting that looks at the horrors of humanity during the Spanish civil war in a way in which we can digest and learn from without being completely repelled. But at the end of the day I think artists who are drawn to paint do so because of its materiality and versatility as a medium. There is a level of instant gratification that appeals to me. With oil painting, mistakes can be fixed, paintings can be re-worked and there is a lot of mentally challenging hand/ eye processing that happens. Never a dull moment unless you paint a dull painting! This is a really hard question for me to answer as I admire so many artworks, both contemporary and traditional. I became quite teary-eyed when I saw a drawing by German artist Kathe Kollwitz in Cologne titled, Woman with Dead Child. I remember thinking that this drawing is so beautiful yet there is such sadness. How she captured her subject moved me. She was such an incredible artist who communicated completely the plight of the lower classes through her expressive and delicate draughtsmanship. I have always looked to the impressionists and post impressionists for answers to my painting questions. I love Degas, Streeton, Roberts, Gaugain, Manet, Monet, Whistler, Sorolla… the list goes on. I love them all! Australian painting also speaks volumes to me. Arthur Boyd had so many comments about humanity with the Australian landscape as the backdrop. This recontextualised his concerns completely and gave them new meaning. Genius! What are your creative influences? My creative influences are my artist friends. They constantly inspire and encourage. I love seeing what they’re doing and how they manage to stay creative in this fast paced and demanding world. What other forms of creative expression do you enjoy that feeds your creativity? Listening to music is very important for my creativity in the studio. Walking and immersing myself within the natural environment where I can daydream and wander with my thoughts and plan new paintings. Photography is also a wonderful tool that feeds into my practice. Do you think about work you have previously made? Does it leave your head once you have completed it or does it continue to develop into new work? No it doesn’t leave my head. It continues to inform my work and can direct a new series of work. Often when I paint towards an exhibition I have many ideas that do not come to fruition because of time limits. So the ideas and paintings flow on until I get the urge to take a new direction. What artist has influenced you the most? Different artists have influenced me at different times. I have surely been influenced by Australian impressionism and contemporary Australian artists but I can’t name just one! How do you start a painting? Do you draw foundations and build from there, or do you just start with paint? Do you make preliminary drawings? I often sketch out my ideas for paintings in sketchbooks to nut-out any compositional issues before painting. I generally find if the sketch looks OK and is working than the painting should work. It has more potential for success anyway. Are the figures determined by the landscape or vice versa? Do you see the image first in your head or build it on the painting surface as you work? Both. I like to have a direction of what I am doing but also play with the painted surface and try techniques that will enhance the conceptual meaning of the work. You currently work figure separate to your landscape, would you consider combining the two? The figures are always in the landscape but to make bigger work that deals with the figure in the landscape, yes, I aim to do that. But to do it well and with meaning takes time and experimentation. Do you use photographs as source material or as reference? I work from references like film stills or historical photographs. I also take my own figurative photographs. Photographs are great for painters but I don’t rely on them soley because I don’t wish to make static paintings. I want the paint and painting to make the picture and tell the story. Otherwise what is the point of painting? What role does memory play in your work? Memory plays a very important role in my work. Conceptually, my paintings are remembering who has been in this landscape before now. My current painting practice explores the tradition of landscape with a focus on the temporal; the idea that places remember their past whilst always being at the mercy of human intervention and other forces of change. Do you work En Plein Air? If so which is easier – working in the studio or en plein air? Is the latter more immediate, or does it require follow-up work in the studio? Yes I love to paint in situ and then I develop these paintings on a bigger scale in the studio. Working outdoors within the landscape informs your studio paintings. Working outside has its problems, for example, insects and bugs can fly into your wet painting! I think to paint outdoors you have to accept you will get grubby and make a mess and at times it will be uncomfortable with the hot sun or cold. But if you make a good painting it was worth it. Tell me more about the underlying meaning in your work, especially the references to a narrative and history. My paintings work with elements of pictorial ambiguity and mystery to explore the landscape and figure/field relationships as a means by which I can express the psychological and metaphysical aspects of ‘Landscape’. My current work makes direct reference to narratives that focus on the notion of being ‘lost’ either to a place or by misadventure. Peter Weir’s adaptation of Picnic at Hanging Rock and The Audrey’s song, Little Molly, have been the basis for many of the paintings and influenced the direction my current series. Both references have a psychological connection to landscape and conjure imagery of people ‘lost’, whether in a physical or emotional sense, in a place of beauty within the Australian Landscape. Theoretically the Australian Gothic mode is a notion which resonates with the ideas underpinning my work, in particular the writing of Gerry Turcotte and his paper, ‘Australian Gothic’, 1998 which has isolated and described several ideas which influence my practice. From its inception the Gothic has dealt with fears and themes which are endemic in the colonial experience: isolation, entrapment, fear of pursuit and fear of the unknown. And for each, the possibility of transformation, of surviving the dislocation, acts as a driving hope. This exhibition Reflection/Refraction brings together three Sydney based artists who enhance our memories of reality with light. As the quote suggests, light can greatly influence our experience of a place or event. Each artist touches on certain events that reflect the environmental changes in our atmosphere, oceans and waterways. Each artist highlights the nature of an everyday experience; a lake, the ocean floor and cloud formations, but they are asking us to question these surrounds from an environmental perspective. Cade Turner’s black and white photographs of clouds titled Cielo allow the light to enhance form and movement, while his photo series titled Away explores a nostalgic relationship with nature in a soft and hazy light. Peta Dzubiel paints lush oils of lakes titled Arcadia, where the fading light is reflected by the water surface. Peta’s new figurative work harks back to a time when nature was experienced at a distance or as something to conquer. While the detailed ceramics by Karen Stuart engage present concerns for coral bleaching. The light filled coral ceramics are enhanced by a subtle use of colour, the series is titled SEA. Each artist, independent of each other, has explored the variety of light found in each location. Each location has a story that intermingles a Romantic and impressionistic visual language. Historically Romantic Artists were concerned with the power of nature and the sublime experience it provided. Here each artist is providing a sublime experience but one that is not about nature’s power but instead they highlight the beauty and greatness of nature’s liquid paths. The impressionistic light reflected in each artwork reveals a considered observation of a glow or the movement of time and it allows the immersive experience to take hold. Delicate seaweed and coral evokes memories of the ocean floor. Are these Ceramics of coral that are globally warmed and bleached? Photograph’s of the light bouncing off a cloud quickly establishing a sense of form. Is this our atmosphere, how clean is it and how warm is it? Numerous questions are provoked by these artworks often with an underlying concern for the environment. The figurative work by both Cade and Peta intertwines place and time with a sense of nostalgia. Are these relationships with nature from the past or are they relationships we should be focusing on now? Both artist’s work using two very different mediums, one the camera and the other oil paint and yet the vision they both share reflects one of atmospheric deliberation. In each view you are drawn to colour, movement and the subtle form, but you are left to draw your own conclusions, what is actually going to happen, what has happened or what just is. In today’s climate eco-criticism is leading the way offering new ways to examine our concerns and relationships with nature, equally art is taking a lead by providing a pedagogical experience to inspire us to engage with nature. Each artist invites us to observe the light and the details that are a reminder of what is and what will hopefully remain. If we all learn something from the experience of viewing these artworks, if we can view nature in a new light and seek a new relationship with nature then these artworks have been prodigious. 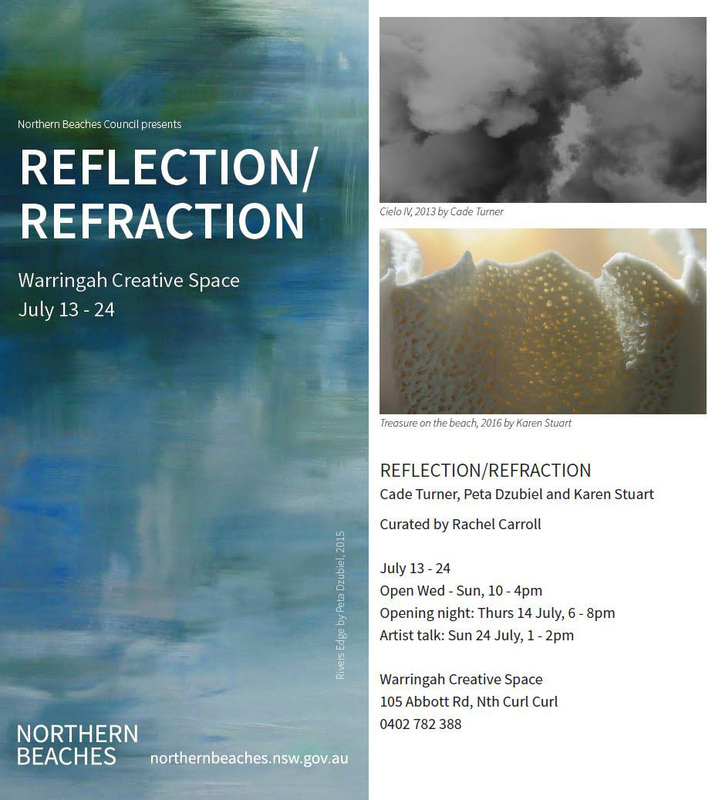 I am pleased to tell you my paintings are in a group show presented by Northern Beaches Council titled Reflection/Refraction. The exhibition runs during July at Warringah Creative Space 105 Abbott Road North Curl Curl. Reflection/Refraction is a curated exhibition by Rachel Carroll. It presents three emerging Northern Beaches Artists who explore the notion of light. Work by Peta Dzubiel – oil paintings, Cade Turner – photographs and Karen Stuart – ceramics.